There’s no ‘sane’ taxi anyway, but this taxi has lost it! It jumps over other cars and mindlessly flips across lanes. If it weren’t for the accidents, we would have loved to have one such Crazy Taxi on our roads! Press space bar to jump over vehicles. 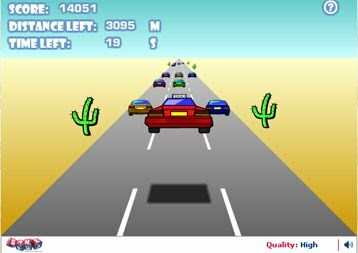 Press ‘right’ and ‘left’ arrow keys to flip across lanes, ‘up’ key to accelerate and ‘down’ key to slow down. Win the ‘Lord of Crazy’ Medal for scoring more than 15000 points!